No one will guess what the middle layers (parsnips) are. This is really a delicious dish full of good nutrients and though tasting very rich, is really quite light on the belly. This is a perfect dish to accompany your plentiful Thanksgiving fare. 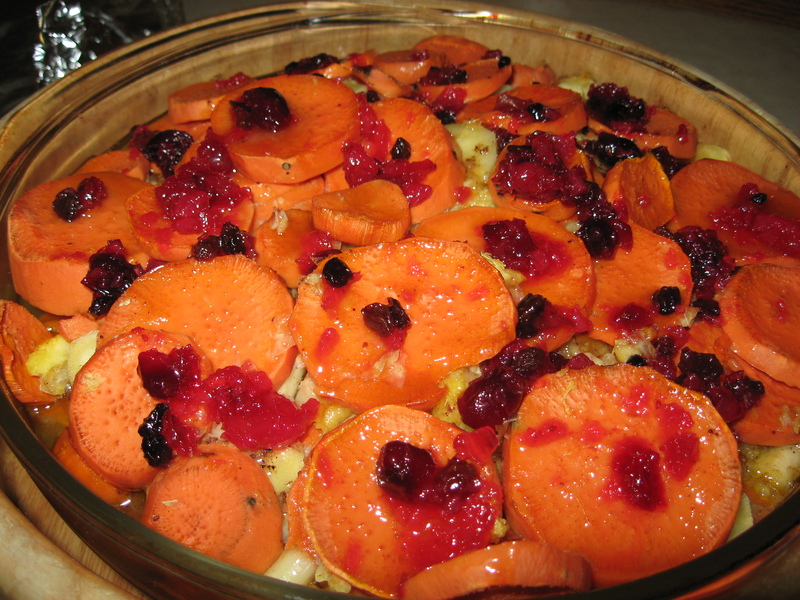 It’s also an overnight dish so that makes it a bit easier for the cook making the big day fixings on Thanksgiving Day. 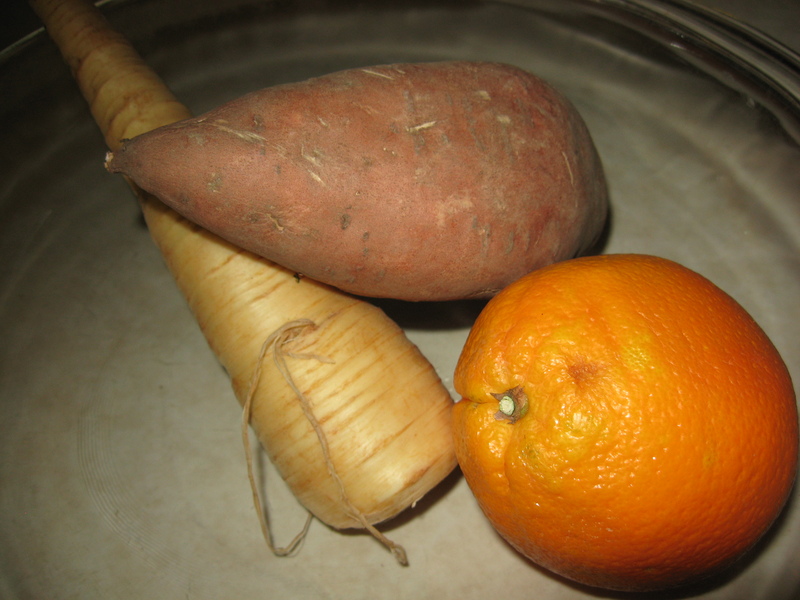 Peel yams and parsnips and slice in ¼ inch thick slices. Roughly divide the yams in 3 parts and the parsnips in 2 parts to make layering easy. Zest 1 orange and after juice it. Then take the remainder of the orange and place in a blender with a splash of water if necessary. Blend on liquidize and use half or more for this dish. Put in a dish the orange zest; put in a dish the pulverized pulp; put ½ of the brown sugar and the 2 oz. (1/2 a cube) of the sweet butter in a microwave dish, micro a minute or so and then put in the nutmeg, and S&P to taste. These ingredients will be sprinkled over your five layers. Make 3 layers of yams with 2 layers of parsnips in between sprinkling on each layer the mixture ingredients listed in #3. Mix together orange juice, some more pulverized pulp if any is left, and the 2 C. of boiling water and pour over yams and parsnips. If you wish you can add 1 heaping Tblsp. of honey to this mixture. Cover the baking dish tightly with foil and bake in the upper third of a 400 degree oven for 20 minutes. Reduce the heat to 350 degrees and bake 20 minutes more. The next day remove dish from frig. and heat in microwave the other ½ of the brown sugar, 2 Tblsp. honey, and the other 2 oz (1/2 a cube). of butter and pour over top of dish. Let dish get to room temp and place in a 375 degree oven for approximately 20 minutes or when more of the liquid is absorbed and the top is brown. To decorate even more, you can sprinkle a bit of cranberry sauce on top.